Happy Halloween, everybody! This week we’ve got a bunch of Treehouse of Horror related links, include quite a few to people who decided to list individual segments. As always, some are better than others and Zombie Simpsons only gets the occasional pity mention (if that). In addition we’ve got some live sightings of Simpsons clothing, video game ideas, cool tattoos, and a new food blog. Patented Space-Age Out of This World Moon Waffles – Someone actually made them. And it’s part of a new Simpsons food blog. And that blog is called “Eats Like a Duck”. Yes! Along came these two cool dudes…. – Some truly excellent Simpsons tattoos, including donut-headed Homer, Kirk van Houten’s album, the Space Coyote, and Scrabble letters. The Definitive List of the Best Simpsons Episodes Ever – This certainly isn’t definitive, but it’s a very good list and has lots of great YouTube. Five Simpsons Games that Need to Get Made – The kart racing idea pops up from time to time, and done right it would be excellent and have tons of things that put the Luigi Stare to shame. Not all the features FXX promised are up and coming yet, the video playback is not quite as consistent as that of Netflix or HBOGo, and most importantly, the show isn’t screened in its original 4:3 ratio, cropping the older episodes and hurting many of the sight gags (fortunately, FXX has promised these problems will be resolved soon). Have they actually said that they’re going to change the player to do 4:3? I don’t think I’ve seen that anywhere, and they seem really wedded to everything being widescreen. Simpsons World: Maybe Not The “Worst. App. Ever.” – One more very mixed review. Does Anybody Want the Last Homer? – A clever cartoon, possibly from the Planet of the Donuts. 13 great Simpsons Treehouse Of Horror Halloween stories – The only thing from Zombie Simpsons is “Night of the Dolphin”, which I’ve always kinda liked, so hooray for this list. The 9 Best Treehouse of Horror Segments According to Critics – Some schmuck from NPR picked a Zombie Simpsons segment, but other than that this one is great. Top 5 Halloween TV Episodes – Wisely, the kids at the University of Arizona didn’t try to cram all the Treehouse of Horrors in, they just said watch ’em. Spooky Wednesday List: Top 5 Halloween Specials – This one just recommends “Treehouse of Horror V”, but sagely points out that there are many more. The Raven by Edgar Allan Poe – It just wouldn’t be Halloween without Poe, James Earl Jones, and The Simpsons. Subsequently Strange – A top five list of Treehouse segments, with nary a trace of Zombie Simpsons. Bravo. Where Have I Seen Dan Castellaneta? All His Non-Simpsons Acting. – Shame on you, Uproxx, you neglected to include his stint as the very Hibbert like “Dr. Stein” on Arrested Development. All 25 ‘Treehouse Of Horror’ Episodes Of ‘The Simpsons,’ Ranked – Better, Uproxx, better. Though why you ranked this year’s above “X” or “XI” is beyond me. Halloween 2014: The best Simpsons Treehouse of Horror episodes to watch this Halloween – There’s one Zombie Simpsons episode in here for some reason, but other than that it’s solid. Apparently when your pregnant wife tells you to hold her drink while she goes to the toilet you’re supposed to drink it, not stand there like an idiot and return it in its undisturbed state. This happened to me more than once. 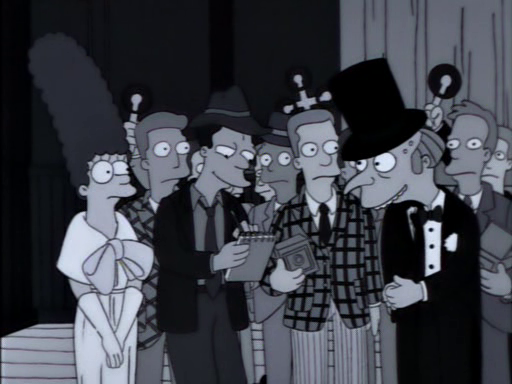 I’m pretty sure that Jo viewed me like this scene from The Simpsons. New breed of dolphins venture on land in hunt for food – The dolphin apocalypse is still a long way off, but you can’t talk about them eating on land without mentioning that one segment from Season 12 (with .gif). Today on the tray: Greasy foods – Apparently last Saturday was Greasy Foods Day. Dr. Nick approves. I took a vacation day to await the arrival of my new pantry. David Henne told me that was the least manly reason to take a day off from work, but I think that’s hyperbole. Maybe it would’ve been more acceptable if I spent the day watching 10-15 episodes of The Simpsons, but the best my DVR had to offer was latter-day “Treehouse of Horror” episodes. Classic Vintage “The Simpsons” Neck Tie – That’s actually a pretty good Simpsons tie, what with it having just the kids and an actual pattern on it. It’s a Simpson’s Family Pizza Dinner – Lego Simpsons sitting down to eat. Artist creates comic posters titled ‘Homerization’: Indianised version of Homer from Simpsons – And lots of them. When Flanders Failed – Episode #038 – Ash is back on his game with a twofer this week. 2. How does making Bart smoke every single cigarette teach him a lesson? What lesson was Homer trying to teach him here? How to smoke? The life of a Writer … – Heh. #TBT post – Simpson fashion in the wild at Universal Studios. New trending GIF tagged tv television the simpsons… – Teacher. Mother. Secret Lover. New trending GIF tagged cartoon loop the simpsons… – Homer, trying to see what Bart wrote on the back of his skull. New trending GIF tagged the simpsons nicki minaj… – Skinner tying his shoe, and the Sir Mix-A-Lot subtitle is great. Thanks for the shout out! I’m going to tackle all the classics like the Good Morning Burger and Nuts and Gum, hopefully without having to go on disability and needing a special dialing wand. You know, I like the Simpsons karting idea. It could work if done right. While not completely Simpsons-centered, if you’ll indulge me, allow me to remain in the realm of popular Nintendo franchises and suggest a Super Smash Bros.-esque fighter spanning multiple animated shows, including not only The Simpsons but also the likes of Family Guy, Futurama, South Park, etc., etc. Considering the many characters one can play as in SSB and how their moves differ (ranging from lasers and swords to body slams and farting), as well as the references found in stages, assists, and so forth, the same concept applied to animated shows might be an awesome idea if done right. Who wouldn’t like the idea of Homer Simpson, Stewie Griffin, Bender, and Eric Cartman smacking each other silly at Burns Manor while avoiding the hounds? Granted, it probably won’t ever happen, given licencing and willingness of the voice actors among other things, but if done right (balancing humor/repetiveness of a game, primarily) it would be excellent.